Edinburgh Emergency Medicine - Fenella has started LeJog!!! Fenella's LeJog Challenge is now underway. Throughout her journey we will be posting updates on the LeJog Page. 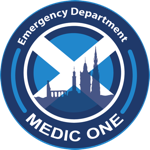 You can still donate in order to help raise money for Medic 1 Charity. See updates from Fenella here.